Red Band Society, Mysteries of Laura, and Madam Secretary, reviewed. Three talented actresses in three terrible shows. 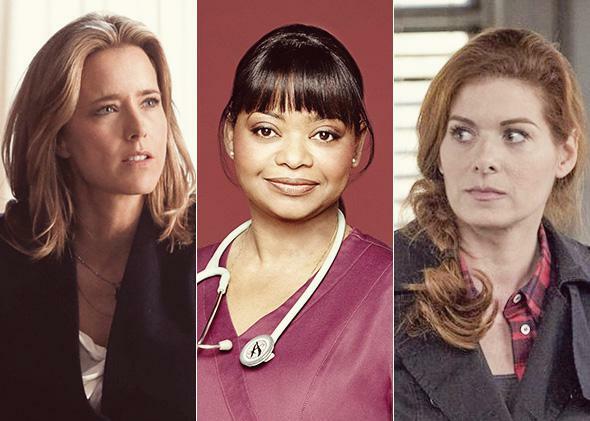 Tea Leoni in Madam Secretary, Octavia Spencer in Red Band Society, and Debra Messing in Mysteries of Laura. Three talented actresses in three terrible shows. Photo composite by Slate. Photos courtesy CBS, Fox, NBC. This week marks the beginning of that annual expense of resources that is the networks’ fall premiere season. For the rest of September and early October, ABC, CBS, Fox, NBC, and perpetual hanger-on the CW will unveil dozens of new series in the hope that at least a few will become hits—even as the definition of “hit” gets more enervated each year. This barrage of new shows is not effective strategically, as it demands that audiences come to new series cranked out en masse on the networks’ schedules, not their own. But the Network TV Bazaar—where pre-fabbed procedurals, sitcoms about lovelorn twentysomethings, a handful of superheroes, and another Shonda Rhimes show are among the many offerings—is, at least, a spectacle, one of the increasingly rare occasions when the networks, and not cable, briefly grab viewers’ attention spans. As with any flea market, when you first start scoping out the merchandise, it looks like there is surely something for you amid all the junk. And then you closely inspect the goods, and begin to suspect that every single series is at least a little defective. The shows are not defective in the same ways. Starting this week are three new dramas that boast, first and foremost among their credentials, very talented veteran actresses. Wednesday brings The Red Band Society (Fox), in which Octavia Spencer plays a stern nurse with a heart of gold caring for a group of very ill teenagers. Also starting Wednesday is The Mysteries of Laura (NBC), a cop dramedy starring Debra Messing, fresh off the scarf-and-singing catastrophe that was Smash. And, on Sunday, CBS releases Madam Secretary, featuring Tea Leoni as a secretary of state who is not much like Hillary Clinton. Red Band Society is shamelessly manipulative and highly effective; Madam Secretary is upstanding and dull; Mysteries of Laura is the biggest, oddest tonal misfire of the entire fall season. Ladies and Gs, please leave the bazaar empty handed. The Red Band Society is narrated by a boy in a coma. He is 9 years old, his name is Charlie, he can hear and see everything, and—like David Copperfield, Huck Finn, and Holden Caulfield before him—he draws us in by bluntly introducing himself: “This is me talking to you from a coma,” he announces. “Deal with it.” He is also adorably wise beyond his years: “The most important part of you that needs to survive is you,” he tells us. Charlie’s narration is cheeky and straightforward in the way of the aforementioned proto-YA protagonists, and bears a passing resemblance to “sick lit” (think The Fault in Our Stars) or a defanged Glee. Like that last show—and like many Sundance movies—Red Band is larded with quirk, twee, and pop music, all of which set my teeth on edge even as they sent my tear ducts into spasm. Charlie, for reasons as yet unknown, occupies a bed in the swankiest hospital that has ever existed, where he looks out upon a group of hormonal teens. There’s the leader, Leo (Charlie Rowe), whose cancerous leg has been amputated; his naughty pal Das (Astro), who, along with Leo, we first see smoking up in a supply closet; Jordi (Nolan Sotillo), Leo’s his new roommate; Emma (Ciara Bravo), a bland, anorexic girl; and Kara (Zoe Levin), a heinous, bitchy, highly watchable cheerleader with a damaged heart. Charlie’s insistence that life doesn’t end when you get to the hospital, it just begins—a necessary conceit for a show set in one—is boosted by this particular hospital’s décor, which includes Danish modern furniture in at least one room and very sick people who do not look poorly at all. These six dangerously ill teenagers do not have one speck of sallow skin or one strand of limp hair among them. Even Leo’s bald head is paired with eyebrows Groucho Marx would admire. Red Band Society is, almost by definition, heart-tugging. It’s hard to watch a 14-year-old joyfully run through a hospital, using his two legs for what he and we know will be the very last time, and not feel something. But this kind of easy sympathizing is the emotional equivalent of the doctor banging your knee with a rubber hammer: It’s a reflex, and it co-exists with the show’s disingenuous and near-total glamorizing of being extraordinarily ill. In the first episode there is no medicine dispatched, no IVs in use, no tiredness, no nausea, no bedpans, and barely any parents. (Red Band does not compare favorably to The Fault in Our Stars in this regard, which had its heroine lament movies in which sick people always look like models.) The adults on hand are a cute and kindly surgeon (David Annable) and Nurse Jackson, Octavia Spencer, who somehow, after almost starring in a remake of Murder She Wrote, signed up for a show in which she is an afterthought, overshadowed by sick kids too plucky to appear sick in mind or body. Tea Leoni is much more front and center in Madam Secretary, in which she plays Elizabeth McCord, a retired CIA analyst contentedly mucking out horse stalls, enjoying her two opinionated children and a frisky marriage to her hunky-professor husband Henry (Tim Daly), when she is called upon by the president, a friend from CIA days, to step in as secretary of state. (The previous secretary has just died in a mysterious plane crash.) Elizabeth reluctantly agrees, and is thrown into a world of high-stakes foreign policy and White House politicking, as well as image management—the secretary of state must not only do good, she must look good—in a show that will tackle a crisis-of-the-week in tandem with longer developing story arcs, à la The Good Wife and Scandal. The last few years have been great ones for political series that center on women and see politics in shades that range from dark to pitch black. (In addition to the two just-named network shows, there’s Veep and Parks and Recreation.) This would seem to create an opportunity for a show like Madam Secretary, which takes an old-fashioned, West Wing–like view of politics as a civic duty performed by men and women trying their best in complicated situations. But instead of feeling pleasantly optimistic, Madam Secretary is just really, really dull, as if someone tried to make a counterweight to Scandal with only the boring parts—plus one shamelessly ripped-off conspiracy theory. The problem is not just that Madam Secretary lacks Scandal’s verve. After all, what doesn’t? It’s that in this moment of ISIS and Ebola, international crises with seemingly no solution, the NSA and vicious partisanship, domestic disasters in which “doing one’s best” has pernicious, awful results, a relatively positive and mellow outlook on politics feels not just inert but woefully insipid. Madam Secretary is not as complicated as the moment. In the pilot, two American boys are kidnapped in Syria. The show uses this as an opportunity for the secretary of state to prove her mettle, a scoffably positive outcome given that recent real life events have shown such circumstances to be proof, instead, of official powerlessness. Mysteries of Laura, meanwhile, could use a helping or two of Madam Secretary’s seriousness. Or maybe it could use more silliness. Something to rescue it from its current tonal no-man’s land, a zone of strangeness unmatched by any other new series this season. The show seems to be going for a vibe somewhat like that of the movie Clue—playfully cartoonish, with a heavily stylized, unrealistic, comedic air. But it achieves this only sporadically. More often, it feels like a spoof that barely knows it’s a spoof. Debra Messing’s Laura is a brilliant homicide detective who has it all under control at work but can’t corral her preschool-age twin sons at home. Her almost-ex-husband Jake (Josh Lucas) isn’t helping: He refuses to be bothered that his boys are behavioral nightmares, convinced his own job as a cop takes precedence over Laura’s. And he continues to flirt with her, even though his cheating is what broke them up in the first place. I think he is supposed to be a charming cad, but I wanted to smack him. In the opening set piece of the show, Laura draws a gun on a perp in a crowded park. When the perp grabs a hostage, she shoots off his ear. Then she wipes off the blood that has spattered on the hostage’s face with a Wet-Nap. This bit isn’t supposed to seem plausible so much as instructive—see, she’s badass and maternal. But pulling a gun on a guy in a crowded public space seems like very bad policing. The first episode shows how out of control she is when it comes to her twins—she blackmails an innocent cheerleading coach to get an interview for them at a fancy preschool and later sedates the twins with cough syrup—but she seems equally inappropriate on the job, slurping down a cup of wine at work, having the precinct assistant find her a nanny, rolling her eyes at suspects. Laura is another one of the “unlikeable” female protagonists so in vogue right now—complicated, flawed, morally flexible. But the show, with its chipper gloss, doesn’t really want to go there. Sure, she’s a mess, it seems to say, but isn’t she still so cute when being frazzled and breaking all those rules? Just as this is a show about murder and dead people that doesn’t want you to think too much about murder or dead people (only the little puzzles their deaths kick off), it’s also a show about a difficult woman that would rather you mistake her for something simpler, more harmless, more adorable. By the end of the episode, when she reveals who the killer is in a long, rude, highly detailed speech at the victim’s funeral—complete with unnecessary puns about fornication—Mysteries of Laura has pretty successfully convinced us that Laura’s not a mystery. She’s just unbearable.